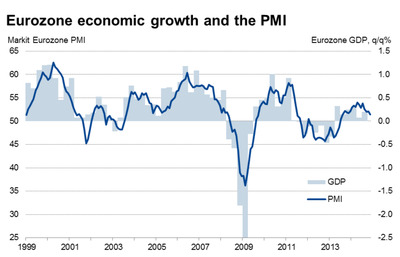 The Eurozone’s composite PMI just came in at 51.4, the lowest in 16 months. That’s after some unexpectedly poor numbers for Germany. The major business survey is pointing to a significant slowdown in Europe. Analysts had expected the PMI (purchasing managers index) figure to come in at 52.3 overall, an improvement from October’s 52.1. Output in the eurozone is falling back towards the neutral 50 mark: anything below that level signals a contraction, and recession. Here’s how it looks against European growth. The German figures weren’t the only poor ones out this morning. France’s PMI numbers were poor again, coming in at just 48.4. Just as the PMI numbers came out, the Italian government confirmed a 1.5% drop in industrial orders between August and September. Policymakers will no doubt be disappointed that recent announcements and stimulus measures are showing no signs of reviving growth. The deteriorating trend in the surveys will add to pressure for the European Central Bank to do more to boost the economy without waiting to gauge the effectiveness of previously-announced initiatives.